There's something magical about snowy winters and northern Norway is a wonderful place to be photographically when the world turns white. The Lofoten Islands are characterised by breath-taking landscapes of deep blue fjords and jagged peaks populated by fishing communities that have called these remote islands home for centuries. In winter the place is a stunningly beautiful as the land is carpeted in white and the red wooden huts that have become iconic of the area make splashes of colour in this most dramatic of landscapes. The first light of the day above the peaks of Lofoten, Norway. 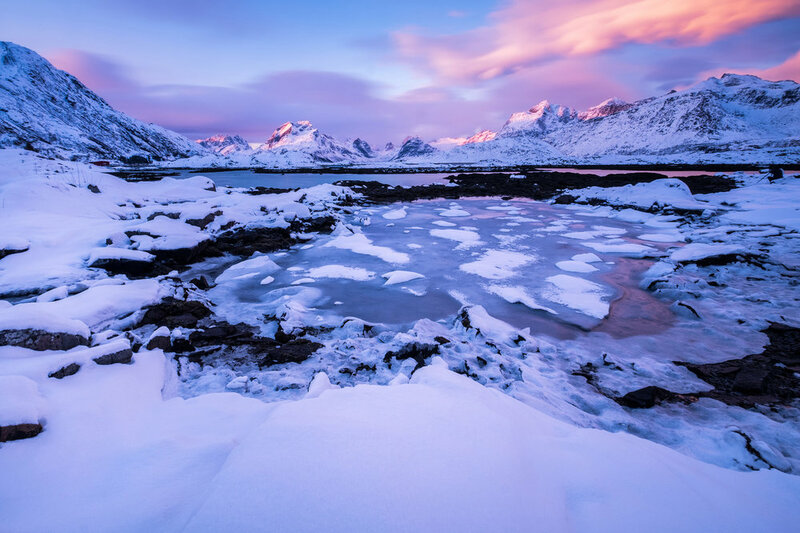 The sun's first light paints the snow covered peaks of Lofoten in winter. I shot this from the ice covered rocks of Vareid. A colourful winter sunrise above the island of Hamnøy in Lofoten, Norway. The northern lights above the peaks next to Haukland beach. This is a self portrait taken from neighbouring Vík beach.